The role of an optician may be best described as one of diversity. There are many different functions that an optician may perform. Opticians differ from optometrists and ophthalmologists in that they do not prescribe correct devices for a patient’s visual needs. Opticians instead design, fit and dispense lenses for that need. They determine the specifications for various ophthalmic devices such as contacts, spectacle lenses and low vision aids. Some opticians also design and fit special appliances to correct cosmetic, traumatic or anatomical defects such as prosthetic eyes. Recently, this discipline has branched out into providing visual therapy for patients with learning disabilities or vision problems that may hinder the ability to read. Opticians also work in some diverse places such as joint practices, hospitals, eyecare centers, or retail stores. Licensed and certified opticians must commit to a standard of professionalism and ongoing education determined by their licensing or certification board. Some are required to hold professional liability insurance and are governed by regulating state agencies. Opticians gather information from patients regarding visual needs, level of activity, protections required and eye/facial features. They manufacture, determine specifications for optical devices and dispense these devices to the patient. Given the number of middle aged and elderly patients whose demography continues to expand, job growth in this field is expected to continue for the next few decades as demand for vision care increases. Optometrists, or optometric physicians, are healthcare professionals concerned with eye health and related structures of the eye as well as the process of vision and disorders and diseases of the eye. They are licensed by the state in which they practice and are required to meet continuing education criteria to maintain licensure. They are licensed to prescribe and fit lenses to correct vision and to diagnose, treat or manage various eye diseases or disorders. They may diagnose, treat, and manage diseases or disorders of the eye through topical and therapeutic drugs as well as oral medications. They are allowed to perform certain types of laser surgery in some states. 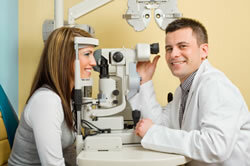 Optometrists are considered Doctors of Optometry and are held to the same legal standards as any physician. They often refer patients to other healthcare professionals for the treatment/management of diseases such as ophthalmologists, neurologists or primary care physicians. The American Optometric Association represents optometrists on a national level in the United States. In order to become an optometrist, you are required to complete a bachelor’s degree which include four semesters of chemistry, two semesters of physics and biology as well as one semester of calculus, statistics, physiology, anatomy, microbiology and psychology. Acceptance to an optometry school is highly competitive since there are only 20 optometry schools in the United States. In addition to a bachelor’s degree, optometrists must also score well on the Optometry Admission Test which will determine admission to an optometry doctorate program. After completing optometry school, graduates have conferred upon them the title of Doctor of Optometry. In order to practice, optometrists must then pass a national exam administered by the National Board of Examiners in Optometry (NBEO). This exam includes questions about basic science, clinical science and patient care. After passing the boards, an optometrist may decide to practice in certain specialties such as neuro-optometry, geriatric optometry or pediatric optometry. Ophthalmologists are medical doctors that deal with the anatomy, physiology and diseases of the eye. They are specialists in medical and surgical eye problems since they are allowed to perform eye surgeries. Becoming an ophthalmologist in the united states requires a bachelor’s degree, medical school and four years of residency with the first year as an intern in surgery, internal medicine, pediatrics or a general transition year. Fellowships may also be pursued in certain specialties several years after residency. Ophthalmologists are board-certified by the American Board of Ophthalmology and may hold either degree as a Doctor of Osteopathic Medicine or as an MD. In order to maintain licensing and re-certification, continuing education is required. This ongoing education is provided by associations such as the American Academy of Ophthalmology and the American Society of Cataract and Refractive Surgery. Additionally, these groups provide support through political pacs and programs to maintain certification. Ophthalmologists may also decide to work in several sub-specialities which deal either with certain diseases or diseases of certain parts of the eye such as the anterior segment, cataracts, corneal diseases, glaucoma, retina, neuro-ophthalmology, ocular oncology, oculoplastics, orbit surgery, ophthalmic pathology, pediatric ophthalmology/strabismus, refractive surgery, uveitis, immunology, vitreo-retinal surgery, etc. The American Board of Opticianry is the largest and most prestigious of all certifying agencies for opticians. Since 1976, the American Board of Opticianry has certified nearly 100,000 opticians with 40,000 of those certifications currently in good standing. ABO Certification designates an optician as having met certain standards of excellence with respect to the field of opticianry and eyecare. Opticians are certified in areas of ocular anatomy/physiology, the manufacture of spectacle lenses, HIPPA compliance regulations, dispensary management, ANSI standards, interpretation and analysis of spectacle prescriptions, fitting and dispensing of spectacles and other ophthalmic devices, and use of standard ophthalmic equipment. Currently, 22 states require both licensing and certification under ABO guidelines. ABO certification demonstrates to those who you interact with in your profession and the industry that you are qualified and competent. Obtaining your certification also proves you take pride in your profession and in maintaining up-to-date skills and knowledge through participation in continuing education courses required to maintain certification. Certification identifies you as a dispenser who will handle their eyewear needs with competence – someone who can be trusted to provide the quality care they want and deserve. Throughout the optical industry there is a large amount of turn over for employees especially at the level of dispensing. Becoming ABO Certified demonstrates a commitment of the resources of time, training, money and education. Being certified imbibes confidence in other eyecare professionals, the general public and the optical industry. The National Academy of Opticianry, founded in 1963, is dedicated solely to the training and furthering of education of over 40,000 opticians through provision of the ophthalmic career progression program, certification and license exam preparations, and continuing education for all levels of opticianry from basic to advanced opticians. The Academy’s Ophthalmic Career Progression Program, or OCPP, is a comprehensive at home study program designed to provide a thorough background in the understanding, consideration and execution of optical knowledge and concepts to assist patient’s in making informed eyewear choices for those currently working in the optical field. The programs offered by the National Academy of Opticianry are designed to prepare the uncertified or apprentice optician for taking the national competency or licensure exams. It is considered the reference of record by the National Apprenticeship and Training Standards Committee for Ophthalmic Dispensing Opticians. Additionally, the programs offered by the NAO are at the center of many state apprenticeship programs that require licensure. The National Academy of Opticianry isn’t only limited to the United States. The programs offered are also recognized in Canada, the Caribbean and the Middle East. The primary objectives of the NAO is to increase the level of competency among ophthalmic dispensers by providing continuing educational opportunities especially for those not attending formal academic programs and to improve eyecare through increased knowledge, skills and competence. In doing so, the Academy hopes to raise the level of awareness among the public in selecting skilled eyecare providers and to better equip opticians to assist the patient in making informed decisions about the eyecare best suited to address their particular visual needs.